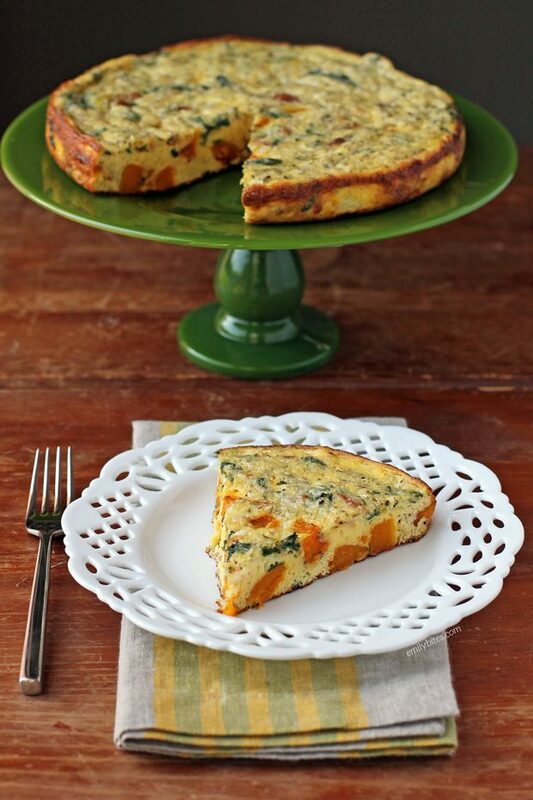 This Butternut Squash Autumn Frittata (or Frittautumn as my word-mashup-loving-husband called it), is such a perfect fall breakfast or brunch dish. The rich, sweet butternut squash, the salty prosciutto and Parmesan cheese, the fresh spinach and flavorful sage and thyme turn this easy egg dish into an explosion of seasonal flavors. If you’ve never cooked a frittata before, don’t be intimidated! It sounds a little fancy but it really couldn’t be easier. Just cook the mix-ins, combine them with the eggs and dairy on the stovetop for a few minutes and then transfer to the oven to finish. Voila! This Butternut Squash Autumn Frittata looks and tastes impressive, so you can make it for yourself, share it with your family or use it to wow your fall brunch guests. After falling in love with the Corn and Zucchini Summer Frittata I posted back in July, I couldn’t wait to create a new one for fall, my absolute favorite season. I now can’t decide which one I love more! I like to serve my frittatas with fruit salad for breakfast or a green salad at brunch. 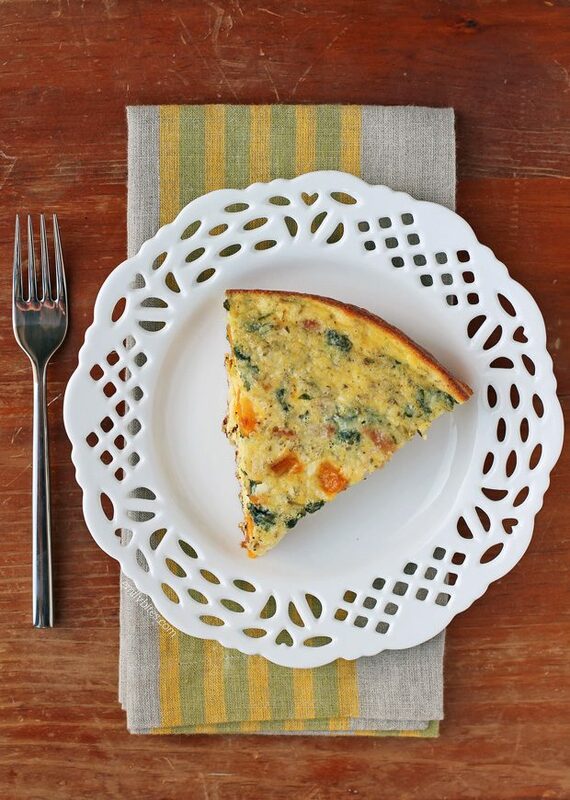 Even better, a slice of this Butternut Squash Autumn Frittata is just 195 calories or 2 Weight Watchers SmartPoints! Bring the oil to medium heat in an 8”-10” oven-safe nonstick skillet over medium heat. Add the cubed butternut squash and stir to coat. Sprinkle with a bit of salt and pepper to taste. Cook, stirring regularly, for 6 minutes. Add the chopped prosciutto and stir together. Continue to cook for an additional 2 minutes. Add the chopped spinach and stir. Cook for 2 more minutes, stirring a few times, until the squash is softened and a bit browned and the spinach is wilted. While the squash is cooking, break the eggs into a large mixing bowl and whisk together until just combined. Add the yogurt, salt, black pepper, sage, thyme and shredded parmesan and stir together until mixed. 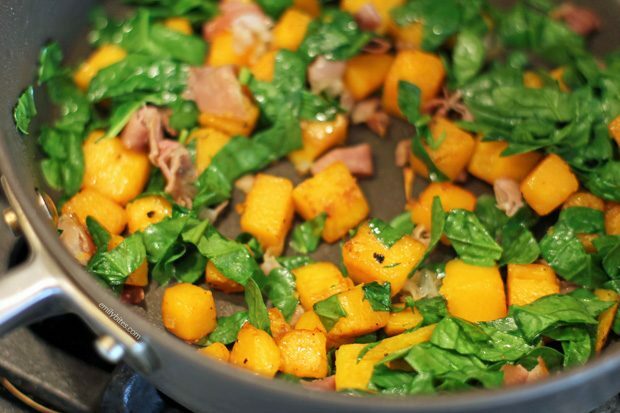 When the squash, prosciutto and spinach are cooked, transfer them into the bowl containing the egg mixture and stir together. Spray the skillet you used liberally with cooking spray and then pour the egg mixture into the skillet. Cook on a burner set to medium heat for 5-7 minutes until the very outside edge of the frittata starts to turn opaque/look cooked. Transfer the skillet into the oven and cook for 15-17 minutes until the center is set. Let cool for 5 minutes, then slice into 6 slices and serve. I made this weekend and it was delicious!! Next time I make it, I’ll omit the 3/4 tsp of salt to the egg mixture. Between the prosciutto and bit of salt on the butternut squash it was plenty salty for my taste. Makes sense, I think I have a high salt tolerance, haha. Definitely adapt to suit your taste! This was amazing! My husband said I could make this every night! I agree with Beth, next time I may omit the salt, I think the prosciutto made it salty enough. This sounds SO good. I am putting this on the meal plan for next week, for sure! I also just LOVE that plate! Made it this morning and YUM! & Filling! I had the pre-shredded/noodled Butternut squash and it blended very nicely. I cut it back to 1/2 tsp and still a little much. Next time I will use 1/4 tsp. This looks wonderful! Can all the ingredients be put together the night before and refrigerated, then baked the next morning? 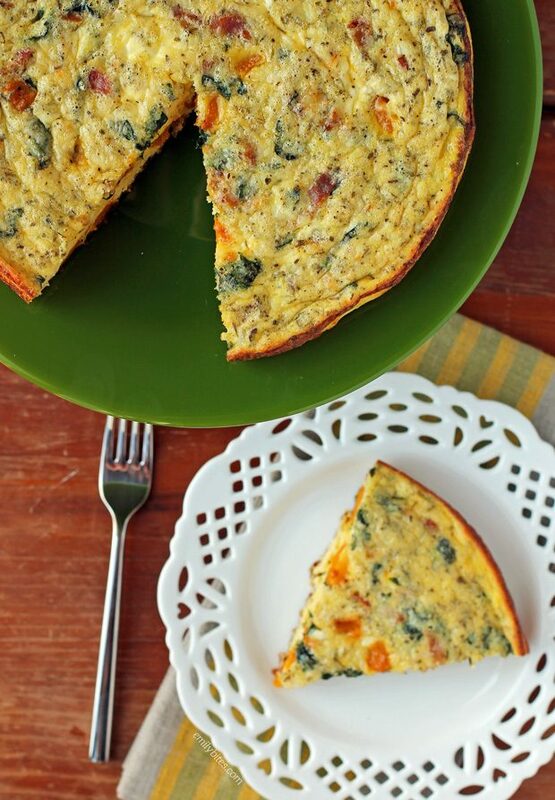 This Frittata is so FANTASTIC!!!! Everyone in my home LOVED it, including my kids!!!! Served with a side of Arugula and a splash of fresh lemon juice! Delicious! Sounds yummy! But wondering if omitting the parmesan cheese would take away? Or can I substitute a non dairy cheese/cheddar? The yogurt usually doesn’t bother me daughter.